The era of Boeing's next-generation rocket family was launched with success Wednesday as the maiden Delta 4 powered its way into Earth orbit to deploy a European-made communications satellite. As night fell along Florida's east coast, the countdown remained on schedule while engineers closely monitored strong high-altitude winds. But Boeing wouldn't be denied this launch opportunity. After years of development and delays along the way, the Delta 4 was cleared for blastoff from Cape Canaveral Air Force Station's rebuilt pad 37B, a complex that was used over 35 years ago to launch unmanned Saturn 1 and 1B rockets to prepare for mankind's voyage to the moon. As clocks ticked off the final seconds, the first large liquid-fueled rocket engine built in the U.S. since the space shuttle main engine a quarter-century ago, the Rocketdyne RS-68 powerplant, surged to life with a ball of golden flame. Moments later the two solid motors strapped to the base of the rocket lit, propelling the Delta 4 rocket into the dusk sky at 5:39 p.m. EST (2239 GMT). The 205-foot tall launcher arced over the Atlantic, heading downrange for a mission to place its paying cargo into geosynchronous transfer orbit and prove to the world Boeing's rocket for the 21st century has the right stuff. Just over 37 minutes after launch, the Eutelsat W5 spacecraft was released into the intended orbit, achieving a needed success to build the Delta 4's reputation and ensure the rocket's future. "This day was a long time in coming but it was worth it," said Will Trafton, president of Boeing Launch Services. "We told everyone from the beginning that we would take our time, we would do it right and that mission success was our number one priority. I think we proved that tonight." "We have successfully demonstrated the new Delta 4 vehicle, and it will have a major impact on the world launch market," said Gale Schluter, vice president and general manager of Boeing Expendable Launch Systems. "Everything had to work perfectly tonight and everything did work perfectly. We put the satellite in precisely the correct orbit, which is the best you could hope for." 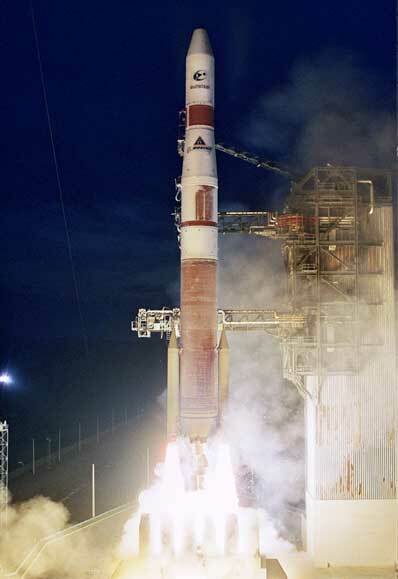 Boeing created the Delta 4 to answer the call from the U.S. Air Force for an Evolved Expendable Launch Vehicle -- a rocket design that would be cheaper and more reliable over today's versions of Titan, Atlas and Delta boosters. The Air Force has ordered 22 Delta 4 launches. In addition to carrying cargos for the military, Delta 4 also will compete head-to-head with Europe's Ariane 5, Lockheed Martin's Atlas 5, the Russian Proton and Sea Launch Zenit rockets for commercial satellite launches. The commercial market is currently overpopulated with many more rockets in supply than satellites demanding a ride to space. Such an environment meant the Delta 4 couldn't afford to stumble on its first launch. The Atlas 5, the other EELV rocket, successfully flew its first flight in August. The next Delta 4 launch is scheduled for February when the first Air Force mission using an EELV will occur. The rocket will loft another satellite in the long line of DSCS military communications spacecraft. Boeing has 26 flights of Delta 4 booked through 2007. Built by Alcatel Space, the W5 communications satellite will cover western Europe, central Asia and the Indian sub-continent. Its two steerable spotbeams can cover northeast Asia including the whole of China and Mongolia to Korea and southern Japan, and southeast Asia to northern parts of Australia. "The launch of W5 sees Eutelsat continuing to fulfill its strategic objective of geographic expansion. We believe W5's central Asian position at 70.5 degrees East will become the satellite of choice for broadcasters, service providers and other users both for regional communications in Asia and connections between Asia and Europe," said Giuliano Berretta, Eutelsat's CEO. W5 features 24 Ku-band transponders and is capable of relaying video programming and providing Internet backbone connections. The satellite, originally called W1, was damaged in a factory fire four years ago. 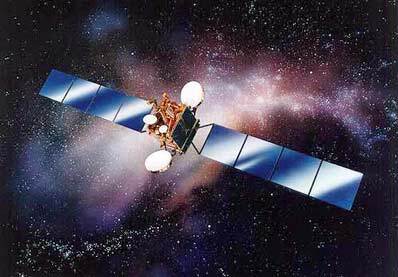 It has been been fixed and tested, giving Eutelsat confidence it will operate successfully for a 12-year on-orbit lifetime. "Within four years we have had time to repair and reconfigure the satellite and to test it successfully to Eutelsat's satisfaction," Alcatel Space vice president Bernard Molestei said.